Wan Lee, owner of OK Photo Studio, still has a few elderly customers who pay to develop film. 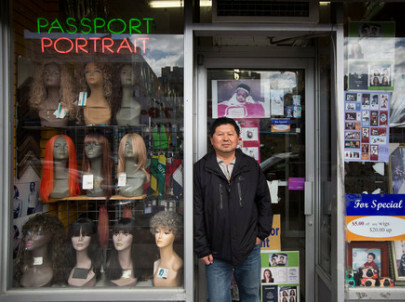 His portrait studio now makes ends meet by sharing the space with a beauty salon. The awning over the front door of Happy Photo in Queens, N.Y., advertises its one-hour service—which is still possible, at least in theory. Almost nobody gets the one-hour treatment these days because the shop only develops about 10 rolls of film each week; it’s more economical to let the jobs accumulate and run them in one batch. Processing 4-inch-by-6-inch photographs was once a brisk business at Happy Photo. Now the shop survives off a hodgepodge of custom-framing jobs and passport photography. Novelty items clutter a display case: a toddler’s face laminated onto a wall clock, newlyweds embracing on the side of a coffee mug. A Noritsu scanner that reads DVDs, USB drives, and other electronic formats is gathering dust in a corner. Nobody even bothers to print digital photos anymore. 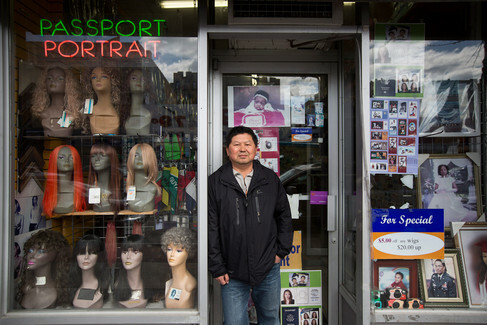 “The photo business is dead,” said Dae Kim, who has managed the shop since 2002. The U.S. counted just 190 one-hour photo shops in 2013, according to new Census data, down from 3,066 in 1998. Extinction looms over other retail niches oriented around analog media. The number of newsstands dropped by nearly half over the past 15 years, and video-rental stores dwindled by 85 percent. But nothing can rival the 94 percent death rate for America’s photo-processing shops, which are vanishing faster than all business categories tracked in the Census. It was the proliferation of color photography, with greater sophistication than black-and-white development, that turned retail photo-processing into a big business, said Mark Osterman, a historian at the George Eastman House, a photography museum in Rochester, N.Y. In 1968, a San Diego-based entrepreneur named Preston Fleet launched Fotomat, and within two years had installed 1,800 photo-processing kiosks in shopping-center parking lots across the country. Soon, Americans were snapping color photos of birthday parties and family vacations—and paying a small army of retail clerks to organize the development process. A Fotomat location in West Peabody, Mass., in 1987. The first nationwide count of photo-processors, in 1988, found more than 6,500 establishments. The figure peaked five years later at 7,600. By then the trends that would eventually doom independent photo-processors were already becoming clear. First came the minilab, which let processors develop color exposures on-site instead of sending film to be processed at a central location. The technology gained popularity in the 1980s and opened the door to larger retailers—pharmacies, supermarkets, etc.—which used photo-processing as a loss leader to attract customers. The pharmacy chain Eckerd opened more than 500 photo labs by 1995, according to company filings. Then came another blow: cheap digital cameras. The result is that Americans take more photos than ever before but rarely print them—and almost never seek out specialists. Wan Lee, the proprietor of OK Photo in Brooklyn, N.Y., develops film at his portrait studio for a handful of elderly customers. Business has fallen off in the past decade, and he’s taken on retail tenants to make ends meet. To reach the counter where Lee still sells the odd roll of 35-millimeter film, patrons pass through a beauty supply shop flanked by a hair salon. Michael Duggal has made a more successful transition. His father opened a processing shop 50 years ago in a Manhattan neighborhood that came to be known as the Photo District. (The area, popular with tech startups, is now called Silicon Alley.) The company embraced digital technology in the late 1980s and rebranded as Duggal Visual Solutions, carving out a niche printing large retail displays for corporate clients and museum-quality photographs for artists like David LaChapelle and Richard Avedon. Less than 1 percent of its $70 million in annual revenue comes from processing film. Duggal sounds the customary warnings about the ephemeral nature of digital pics—an anxious sales pitch that hasn’t stopped Americans from ditching corporeal photos. “Hard drives crash, technology can become obsolete,” he said. “A photographic print can last over 100 years.” The few remaining shops that develop photos won’t last that long.